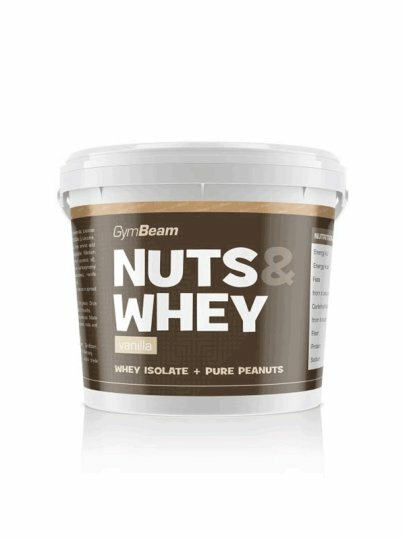 Nuts & Whey is a delicious peanut butter melted in the tongue. Made from fresh peanuts, which gives it a creamy note and is also completely natural. But there is no end to its characteristics because it contains proteins. 100% fried peanuts (80%), lactose free whey protein isolate, BCAA (L-leucine, L-valine, L-isoleucine), powdered cocoa powder, vegetable oils [medium chain vegetable triglycerides (MCT), coconut oil) , emulsifier (sodium carboxymethylcellulose), sweetener (sucralose), vanillin crystals, dye (beta-carotene - carrot yield). This product contains peanuts. It can contain traces of gluten, nuts and seeds.